Designing and constructing a data center is no small undertaking. Heating and cooling, energy efficiency, infrastructure management and scalability must all be considered. A data center must be designed to meet current needs while being able to scale up or down in the future as needed. The tricky part of that with a data center is that if you build a data center that is far bigger than current needs it may not be energy efficient. But, if you build a data center that is just barely big enough and you expand over time you may quickly outgrow your space and find yourself looking to move which is costly and difficult. So, how does one build the illusive immortal data center? Do not fear, it can be achieved. First thing is first, you have to determine the goals of your data center when designing an immortal data center. One of the most important things to consider is scalability. Without scalability, most data centers will outgrow themselves with time. A data center must have dense server racks, do not run racks on only 50% capacity. Increase the density of racks to maximize space. But, you cannot increase rack density without having sufficient cooling options. 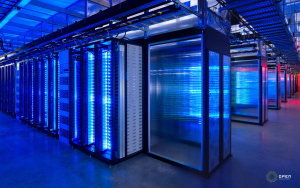 Some data centers prefer to employ hot aisles and cold aisles to help more efficiently heat and cool a data center. By creating hot aisles and cold aisles, or specific zones for certain infrastructure, it can drastically improve energy efficiency and reduce energy expenses. If hot aisles or cold aisles are not ideal for your data center, consider adding a high density room where cooling energy can be focused to the most demanding area and the rest of the data center can be kept at a warmer temperature. This will help keep costs down while still efficiently cooling high density server racks. Additionally, when designing an immortal, future-proof data center, it is wise to look at green and more efficient methods of cooling. By implementing green methods you can save significantly over time while still effectively cooling a data center. The last consideration for all data centers is the cloud. The cloud is really the way of the future and many data centers are converting to more and more cloud usage to reduce physical infrastructure. This helps free up additional room in a data center and reduce heating and cooling needs. The cloud is infinitely scalable so it offers immense potential for the future and is a significant tool to keep any data center remain immortal. This entry was posted in Computer Room Design, Data Center Build, Data Center Construction, Data Center Design and tagged Data Center, data center build, Data Center Construction, data center design, scottsdale data center design. Bookmark the permalink.